The Slow Death Of The NFL? I should say at the outset that I’ve never really been a big football fan. I grew up in Detroit and played hockey, so I love the Redwings. Besides, we didn’t really have a professional team in Detroit; we only had the Lions. Jokes aside, I watched it nearly every week. Not intently, but it was on in the background because it’s easy to do other things with football on. Whether it’s cleaning, writing or whatever, there are long stretches of time during a football game where nothing much happens. And if anything interesting does happen the announcer’s voice and crowd noise give it away and you can look at the TV. If you miss that, they replay it immediately. It’s the perfect sport to ignore while you get other things done. Now it’s become, for me, a sport to simply ignore – period. HGTV was my refuge. Watching a marathon of real people get their houses remodeled was much more entertaining than watching pampered millionaires wrestle in taxpayer-funded stadiums while disrespecting the national anthem and the American flag. Since I wasn’t a rabid fan the NFL won’t really notice that I’m gone. But I’m not alone. Through my radio show, social media, and life I have heard from scores of people who are diehard fans, and they’re done too. More importantly for the NFL and the players, they’re beyond angry. Lifelong fans feel betrayed. Anger fades with time, but the sting of betrayal lingers. This was a foreseeable eventuality, akin to being hit by a train because you were playing on the tracks and refused to move. The damage to the NFL began when Commissioner Roger Goodell chose to side with left-wing activists over the game in the hope of placating them and absolving himself from his failures to properly address domestic violence by some players. Activist groups were vocal critics of slaps on the wrists for players abusing their wives or girlfriends. But left-wing activist groups don’t stop, ever. Even when something is (eventually) made right and harsher penalties were handed out. Because they can fundraise off of it and, equally as important to them, they hate professional sports. Activist liberals always have hated sports, even when they use it. They hate competition – championing ending scorekeeping in youth sports – because there are winners and losers, and they hate meritocracy. If professional sports is anything it is a meritocracy. Only the best survive, regardless of race, ethnicity, sexual orientation, and all the other boxes liberals have created to divide people. Professional sports has no time for any of that; there’s too much money in winning. And professional sports is a business. At least it used to be. 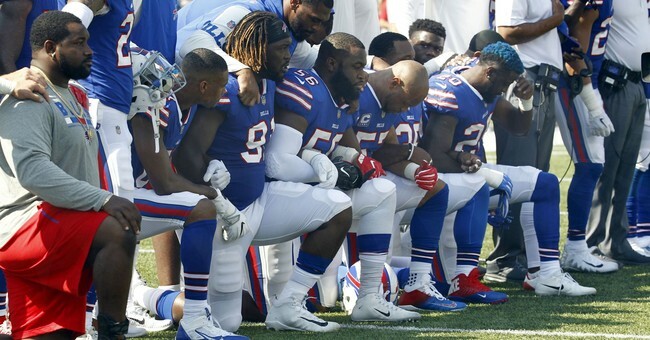 It has evolved from an organization that fined Jim McMahon for writing messages on his headbands to one that ignored players perpetuating the lie of “hands up, don’t shoot.” From blocking the Dallas Cowboys from honoring five police officers who were murdered by a militant racist inspired by anti-police activists to ignoring Colin Kaepernick wearing socks portraying police as pigs. It seemed like a league held hostage by Kaepernick’s racism; in fear of being called racist itself. Now it’s an enabler of ignorance. Putting aside the ignorance of the issue, because it doesn’t really matter what the protests are about. The method is what is destroying the NFL. There could not have been a worse target for a protest than the national anthem in a sport that has marinated itself in patriotism. Sure, it was paid for – nothing in the NFL is free – but they cashed the checks. When Kaepernick chose to protest during the national anthem all people saw was a protest of the national anthem. That Goodell and his highly paid PR team didn’t recognize this fact and squash it like they did DeAngelo Williams’ desire to pay tribute to his late mother by wearing pink to raise breast cancer awareness is a testament to the fear and desire for self-preservation that has marked his tenure. You can’t claim to support the First Amendment rights of your players when you deny them the ability to honor their mothers or excessively celebrate touchdowns. Yet that’s what the NFL tried to do. And it failed, miserably. Cowboys owner Jerry Jones tried to stop the hemorrhaging by kneeling before the anthem with his team, then they all stood for it. Would’ve been smart to think of that before, now, for many, it’s just too late. I won’t miss it because I was never really emotionally invested in it. But the NFL has millions of fans who’ve happily handed over their hard-earned money for years who are now feeling like they’ve been conned the whole time. Maybe they were.